Last week I had a goal: create a headboard and have in place by the time the hubby was back in town (Saturday). I had originally thought maybe the entire headboard project would be a surprise, but I wanted to make sure he would like the headboard so I showed him a picture a few weeks ago and got the thumbs up. J was going to be out of town all week so surely I could finish this lil project in that time, right? Wrong. A good friend of mine told me that the project isn’t going well until it takes twice as long and requires multiple trips to Home Depot. That must be true because 4 trips to Home Depot, 2 trips to Joanns, one cry fest in the Home Depot parking lot and a failed fabric dying attempt later, I have a headboard that I LOVE. It is seriously beautiful and looks like we could have bought it from somewhere like Pottery Barn. And the best part — anyone can make this. Seriously. I found a tutorial on HGTV which was great, but left out lots of details which might have eliminated some of those extra trips to the store. 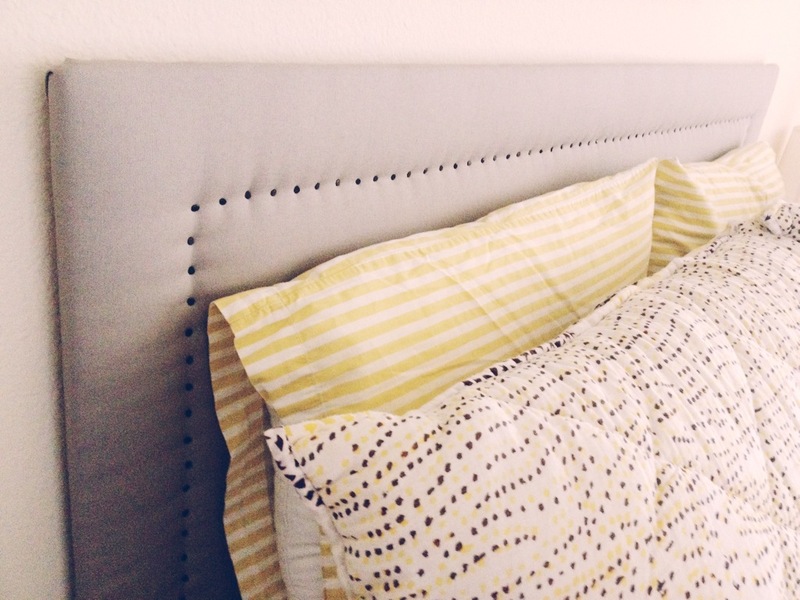 I’m going to explain how to make this headboard as clearly as I can so that you can make one too! • a piece of plywood, 48″ tall x 61″ wide for a queen sized bed (if your bed is another size, measure the mattress width and add an inch for the width). I bought 1/2 inch plywood; you can use thicker if you want. I chose this thickness because a) it was cheaper and b) I could move it myself; thicker would have been too heavy for me. Another note on the plywood — good quality plywood is expensive. You don’t need plywood with a nice smooth finish as it will be covered up. Choose a mid-grade plywood, just make sure that it doesn’t bow (bend or curve) at all. My husband suggested that I lay it on the floor at Home Depot before they cut it to make sure it would lay flat. 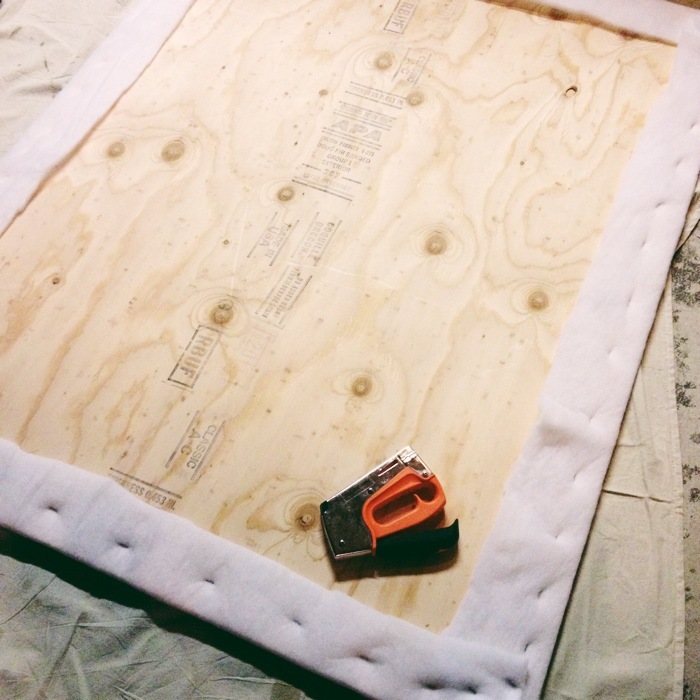 Plywood comes in 4′ x 8′ size; I had a nice fellow at Home Depot cut my plywood to size to save a step at home. • 2 layers of extra thick (hi-loft) batting. For my queen sized bed, I purchased 2 bags of the twin-sized quilting batting (72″ x 90″) which had plenty extra to wrap around the edges. • Canvas fabric. 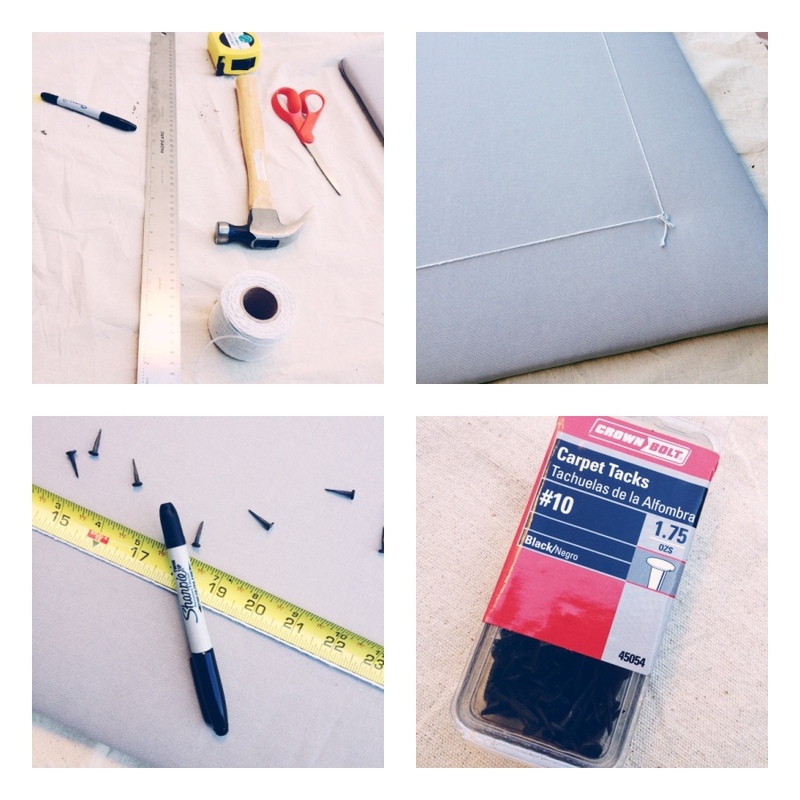 You can go check and just get a natural color canvas drop cloth from a hardware store, or, if you’re like me and want a specific color, buy a colored canvas at a fabric store. 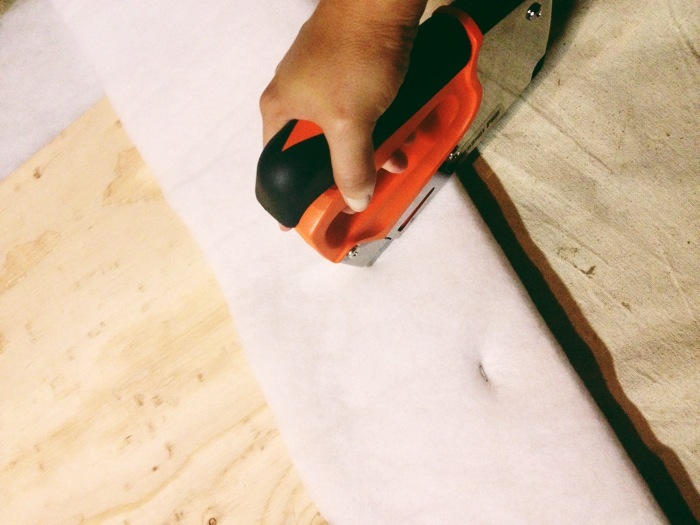 Have the fabric cut so that you have an extra 5-6″ on each side. For my queen size, I bought 2.25 yards of gray canvas fabric at Joanns that was already 60″ tall (so I had a piece that was 60″ x 81″). I started collecting everything I needed a few weeks ago. I didn’t even look around here for gray canvas fabric (silly me) and instead ordered a gray fabric online which I — of course — didn’t like when it came in the mail. It had a lot of blue and purple to it, which was just going to bother me if I had to look at it every day. So I got the bright idea to dye it. 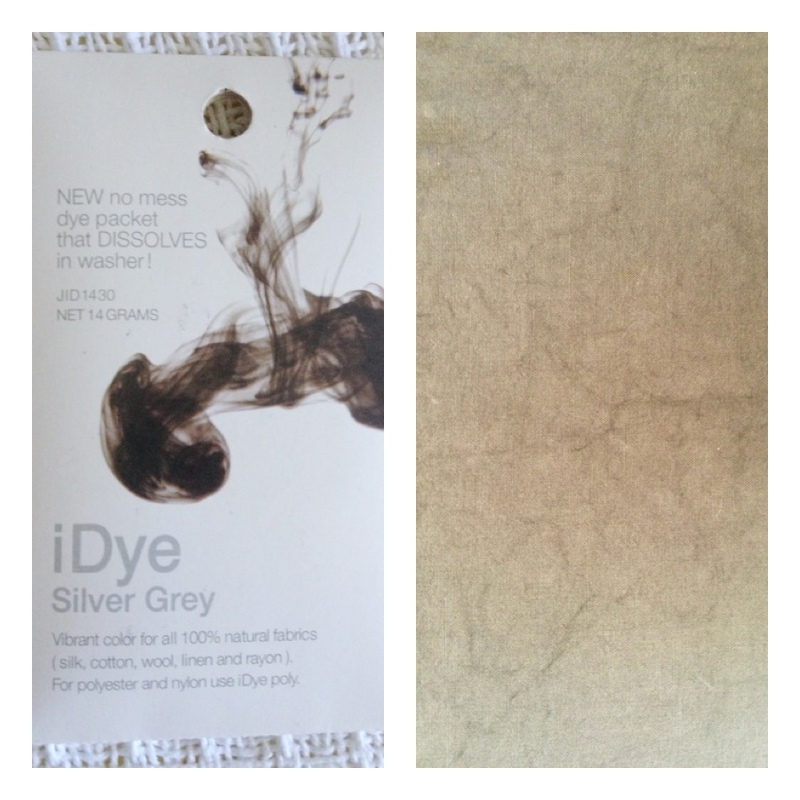 I’d used iDye before, this great fabric dye that you just use in your washer. Unfortunately, I think the fabric was too heavy and the dye couldn’t circulate well so I ended up with fabric that was WAY darker than I wanted and was super streaked. No bueno. I was going to have to find more fabric. Before the fabric dying fail, I had already started collecting everything else I needed and had gotten started on putting the headboard together. First there was the batting. The original DIY tutorial said that I needed 4 layers of batting. Batting ain’t cheap! So instead I decided on 2 layers of extra thick batting, which is perfect in my opinion. I had a 40% off one item couple for Joanns so the batting was about $40. If the store wasn’t so far away, I would have bought the two bags separately to save another $12 but who has time for that? Next it was off to Home Depot. The plan: buy staples, carpet tacks and plywood. No big deal. But here’s where the lack of details on the tutorial I used started to slow me down. I had no idea which size of carpet tacks to get, so I purchased the longest ones (which of course I had to return because they’d poke all the way through my wood) and wandered the plywood aisle feeling lost and confused. They had SO many types of wood, all different thicknesses, ranging in price from $15-$49. I had NO idea what to buy and no one was coming around offering any assistance, so I purchased my staples and tacks and left without any wood. The next day I called J for some assistance. He explained the exciting world of plywood to me, saying that I didn’t need the nice stuff since no one would see it, nor should I get anything heavier than half an inch if I was going to try to move it myself. He also suggested that I measure the car to make sure it would fit. Duh. Of course I already did that, I told him. So I was back at Home Depot the next day, ready to get some wood and get to work. Remember how I measured my car to see if the plywood would fit? Well, I measured the length — 61″ would fit just fine — but failed to measure the width. Ooops. I pushed and struggled and grunted to no avail. The wood was not gonna fit. J was across the country unable to help and it was starting to get dark. Let the tears begin (nothing makes you feel more like a girl than crying outside of a hardware store). I ran inside and begged an employee to let me keep my wood there while I ran home to get plan B — a car with roof racks. He hesitantly agreed and off I went to get our other car before returning to the store where a young guy tried pretty miserably to tie the piece of wood to the roof. He did a pretty awful job of it, so I had to pull over along the way and re-tie the wood down so that it wouldn’t slip off the racks and then still needed to hold it down with one arm while driving with the other. By the time I got home I was frazzled, teary and had one frozen arm. Not my best day. The next night…night #3 of trying to get started on this project…I got started. 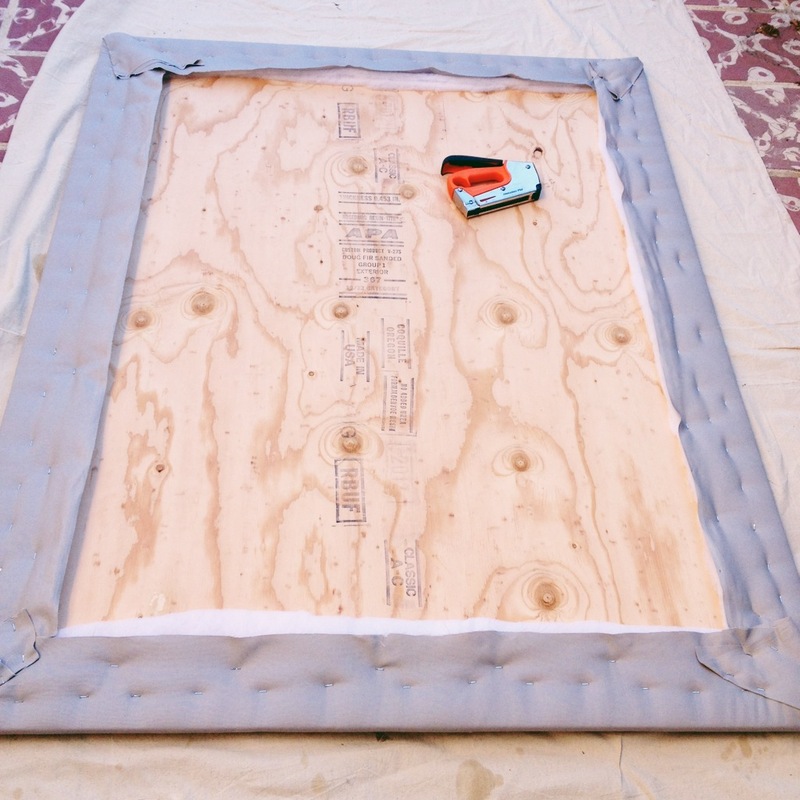 Step #1: spray one side of your plywood with adhesive and smooth your first layer of batting over it, leaving at least 5″ on each side available to fold over and staple. I am so thankful for all the years as an art major when we had to stretch our own canvases. 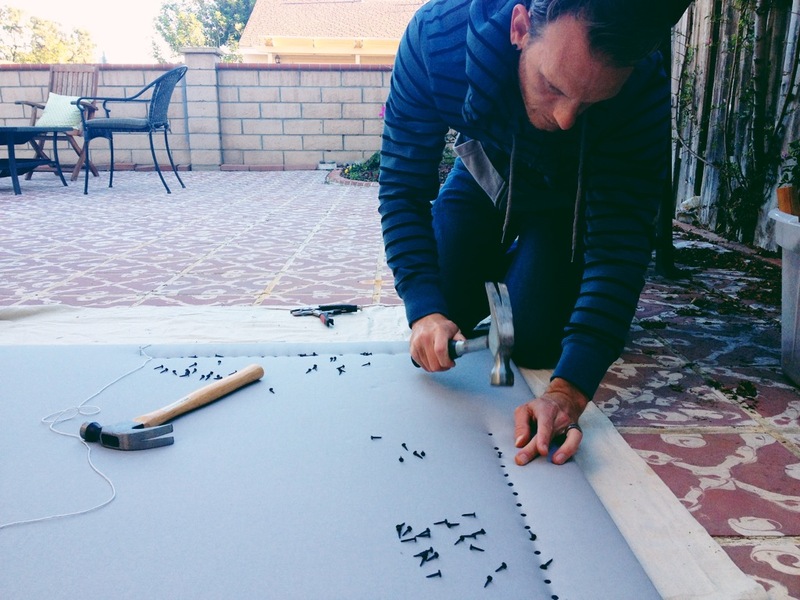 That little nugget of knowledge came in so handy with this project! Once the batting is centered on the sticky plywood, it’s time to secure it. Starting in the middle of each side, staple the excess batting down on the back side of your headboard. I like to do 3 staples in the middle of each side, pulling it tight. Then I go around each side, adding 2 staples out from the middle, pulling the batting tight. This will ensure that your batting (and later, your fabric) won’t show any wrinkles or pulls. Keep stapling towards the corners, doing a staple or two on each side, going around in a circle, until you work your way all the way to the corners. Check the other side as you go to make sure the batting is flat and tight. Here’s a good tutorial to see what I mean. Cut off any excess batting and then secure the corners. Repeat with the next layer of batting. See how tidy the batting looks? This is just after the first layer but I trimmed all the extra batting off so that it would look nice and tidy. Now you’re ready to add the fabric. After my dying fail, J said that he’d prefer a lighter gray fabric. It was a Sunday and I really wanted to finish this project so I went to the only fabric store that was open on a Sunday — Joanne’s. Apparently everyone else had the same idea because there was a line of about 40 people waiting to get fabric cut. Crazy. They had one color of gray duck fabric which is similar to canvas, only heavier, and while it was lighter than I really wanted, I figured it would do. Plus, I had a 60% off coupon so it was only $11 for my second fabric purchase. Success! Back at home it was time to get to work. The fabric process is the same as the batting. Spray adhesive to the batting, center your fabric on top of it and start stapling. It is SUPER important for this step to start in the center when starting stapling your fabric to the back and work out the edges, pulling the fabric tight every time to make sure the end result has no wrinkles or pulling. I added an extra row of staples on the outside of the staples I’d already laid to make sure it was secure and to keep it looking tidy. You’re almost done! It’s time to measure out where the carpet tacks will go. Using a ruler, measure 4 inches out and 4 inches down from your top corners and hammer a nail halfway in that spot. We’re going to mark where the tacks will go and we want them to be in a straight line and perfectly spaced out. Grab some string and tie it tight between the two nails. This is your straight line. Add two more nails on each of the sides, about 24″ down and still 4″ inch from the outside edge. Tie sting here as well. Lining a ruler up next to the string, use a fine tipped marker and put a tiny dot on your fabric at each inch point along the string lines. This is where your tacks will go. Remove the strings and start hammering! This is when I was extra thankful that J was around to help. It turns out that hammering carpet tacks is not my strength. In the time it took me to nail in about 12 inches of tacks, he had finished the two other sides. I loved the look of the carpet tacks. They aren’t perfect circles so they have a bit of an industrial feel to them. Great job! It does look professionally done. I would only try this if you were here to at least direct the project. How did you mount it to the wall? I have all the supplies for the head board, just wanted some extra tips for hanging it. I love the finished product! It’s very clean and sleek looking. For my taste i would have wanted to make it wider. When I make mine I am going to attach legs so that i can screw it to the frame. Thanks for the tutorial it helps a lot! p.s. I don’t know of anyone, even men that don’t have to make at least 2 or 3 trips to the “depot” to finish even the smallest project. You did great!!! Thanks for showing this off! 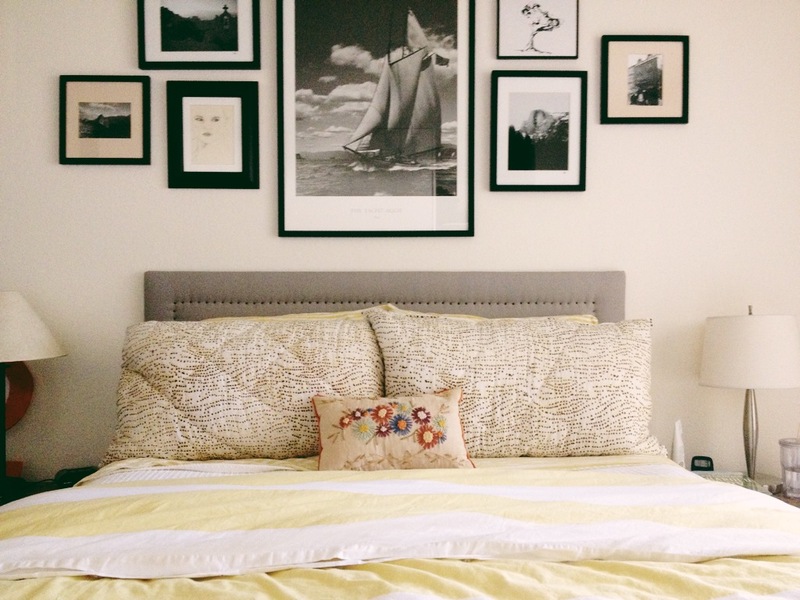 I love all of these headboard ideas. Do you realise you could have had an easier time had you used a magnetic tack hammer instead of a nail driver? I didn’t, but thanks for the tip! My husband had no trouble nailing the tacks in…he finished it in a few minutes, but some other readers starting this project will be thankful for your tip. Good luck! Let me know how they turn out. We still love ours. I'm Alexis. Freelance graphic designer and illustrator. Wife to an amazing man. Hugger. Food lover. I love to share good art and design, good recipes and all the other good stuff in life right here on my blog. Prefer RSS? Sign up here.